Hemel Storm left themselves with far too much to do in the fourth quarter as they went down 85-71 against the Essex Leopards in front of a capacity crowd at Sportspace. Desperately searching for their first ever win against their old nemesis, Hemel could not get off to the fast start they needed and, with Walid Mumuni picking up two early fouls, they trailed 8-3 after three minutes of play. A huge three pointer by Kenroy Wood kept the scores close, but poor shooting from the home side meant that they could not close the gap. It was only another three from Wood late in the quarter and some dogged work under the baskets from centre Tom Adorian that allowed the away side just a seven point lead after one period 24-17. Starting their first fight-back of the night, Storm reduced the arrears to just four points at 31-27 but Essex soon extended it back to beyond 10 points as the home team were the victims of their own carelessness with a number of poor turnovers. Helped by some strange refereeing decisions, all of which seemed to go against the home side, the Leopards built their lead up to 15 points where it stayed until the half -time hooter sounded at 51-36. The crucial third quarter started poorly for the Storm and went downhill from there, as nothing seemed to work offensively, and Essex had soon built up a 20+ lead. A three-pointer from skipper Simon Kearney and six hard earned points from Adorian did at least stem the flow somewhat and, at the end of the perio,d Essex had a 23 point lead at 50-73. The fourth quarter saw Hemel finally get their act together at both ends of the court as they scored the first 11 points and held their opponents scoreless for the first five minutes. It was too little too late, though as some chaotic scenes erupted in the arena following a technical foul on Storm’s head coach Steve Darlow as players, coaches and officials all seemed confused as to what was happening. A further outbreak of booing ensued as play settled down following various Leopards free-throws and, despite some heroic battling, Storm just could not get any closer than 14 points. Wood and Adorian joint top scored for Hemel with 14 points each, followed by Carl Josey with 11 and Kearney with 10. Mumuni got nine points, Damian Edwards hit eight and Michael Darlow bagged five to round off the home side’s scoring. After the game, Darlow bemoaned his team’s poor shooting on the night but said he hoped that, with at least one and possibly two new player signings in the pipeline, things would begin to turn around. 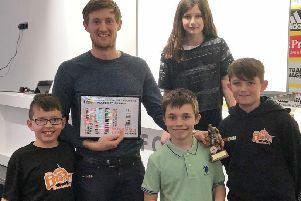 “I’ve set the team a target of seven more wins to make the play-offs and, with some fresh talent coming into the squad, I’m confident this can happen,” he said. Storm’s next home game is at Sportspace on Saturday, January 31 at 7pm against Team Northumbria in a National League Division One game.